Dental Crowns & Bridges | Cosmetic Dentist | Brooks Dental, P.C. When a tooth is weakened due to previous root canal treatment or fracture, it is often recommended by your dentist to have a crown made in order to strengthen the tooth and protect it from further injury. Esthetic, custom-made dental crowns and bridges are available here at Brooks Dental for revitalizing your confident, healthy smile. 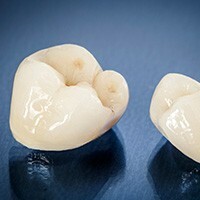 Why Choose Brooks Dental for Crowns & Bridges? A tooth already contains a large filling and needs additional support. A tooth is suffering from advanced tooth decay that cannot be successfully treated with a filling. A tooth has been seriously injured or fractured. A tooth is weakened and has a high risk of fracturing in the near-future without intervention. A tooth has a serious cosmetic imperfection that needs to be corrected. A tooth has been treated with root canal therapy and needs to gain strength and protection. We enjoy recommending all-ceramic, metal-free dental crowns whenever possible for superior aesthetic results. This type of restoration is also made to restore state-of-the-art dental implants. Dental bridges contain multiple prosthetic teeth that are designed to fill in the space(s) left by one or multiple lost teeth in a row, effectively “bridging” their gap. Traditionally, they are anchored sturdily in place with the help of additional dental crowns, which are placed over adjacent healthy teeth. However, this treatment does require the removal of healthy tooth structure. That is why our dentists now strongly recommend opting for single dental implants or an implant-retained dental bridge to restore empty spaces while preserving the other existing teeth that lie adjacent to the space. Implant-retained bridges have the same basic design as traditional bridges, but they are anchored in place over two dental implants that are directly inserted into the jawbone. As a result, the patient’s oral health is better preserved and natural teeth don’t have to be majorly altered to accommodate the new restoration.